An action game similar enough to Joust that today it would be called a clone, though there are some changes to the formula and everything is wrapped in a more kid-friendly and arguably more-readable aesthetic. 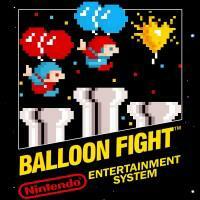 Gameplay still consists of flying fighters in a single-screen arena who battle by bumping into each other with the higher-altitude combatant being the victor, but this time instead of bird-mounted knights the characters are humans held aloft by balloons. Combat doesn’t directly kill the enemy, but pops their balloon. Enemies have only one balloon while player characters have two, which grants players an additional hit point as only one balloon is popped at a time. The controls are still simple to pick up with the only buttons being left, right, and flap. The flight physics are similar but with the added wrinkle of it being harder to gain altitude when the player loses a balloon. This increases the competence zone as players can take an extra hit before losing a life but also presents a challenging alteration for them to deal with. The goal is still to progress through waves of enemies, though this time the arena itself changes more between waves. The game can be played with one or two players, again providing opportunities to cooperate, compete for points, or attack each other directly. On top of this, Balloon Fight adds a new single-player gameplay mode: “Balloon Trip”, which tasks the player with precise flight to collect balloons and avoid hazards in an auto-scrolling level and feels like an ancestor to infinite runners like Jetpack Joyride . Although Joust certainly deserves credit for creating the formula, Balloon Fight presents a worthy evolution, if only an incremental one. It keeps what works - easy-to-learn-and-difficult-to-master flight controls, simple but engaging gameplay, and varied ways to approach multiplayer - and adds in a few clear improvements. It’s the one I’d generally recommend to new players. I Stopped Playing When: While I recognize that Balloon Fight is in many ways the superior game, I’ve only played it a few times, since Joust is the one I grew up with.